When adding this to the demoscene sourcecode BBS thread, I noticed that I never added it to Pouet. So here it is! Platform is bitbox, a small device designed for low-level bit banging with modern hardware (software/DMA generated VGA output, etc), somewhat similar (but not compatible) to the one used in Jupiter&Beyond. 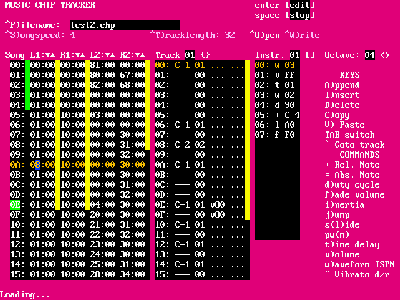 The tracker itself, as well as the sound engine behind it, is heavily based on Hardware Chiptune, which is the only chiptune code I could get to run on the limited hardware at realtime speeds (but I have plans for more complex stuff). Download link points to sourcecode, I'm too lazy to provide a proper build and you probably don't own a bitbox anyway (but you should!). It is possible to build the tracker in "emulator" mode, which generates a native SDL-based executable (on Linux at least, not sure how well this would go on Windows, but feel free to try!). good to have people like you that not only do the hard work but also provide it to others to have fun with and make use of it! rulez added on the 2017-05-21 10:42:25 by ɧ4ɾɗվ. from the looks of this screenshot it even would qualify for girlz (or what other "genders" humanity will have in 200 years). page created in 0.075205 seconds with 15 queries.